The fireplace is the heart of your home or business. For thousands of years the fireplace has been the center of human habitation, providing warmth and marked by lavish architectural and decorative embellishments. With their 30 years of experience, Stromberg can renovate or restore your fireplace with their most popular product, glass fiber reinforced concrete (GFRC). They pride themselves on working closely with you to reproduce your existing style or design exactly; they won’t cut corners. 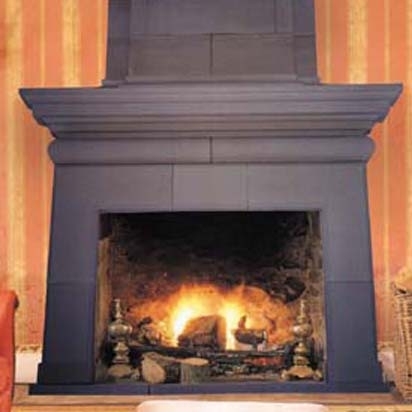 Outdated materials when replaced with GFRC will last for many years and ensure the attractiveness of your fireplace. Stromberg can manufacture GFRC to look like wood or terra cotta tile. Glass fiber reinforced concrete has a higher tensile strength than steel; it won’t crack and has been laboratory tested to stand up to high temperatures, it can also be manufactured to look like wood or terra cotta tile. With their skill and hard work, they’ll respect and reinstate this sough-after focal point in your home or business. Restoration and renovation is challenging, and Stromberg can meet that challenge. They can restore logos, lettering, or create new elements for your custom GFRC fireplace. Stromberg expertise will return your custom fireplace to a source of pride for your home or business. Stromberg professionals pride themselves on knowing the goals and expectations you have for your project; they’re experienced in working with stone and terra cotta, and GFRC can exactly replicate these materials. Stromberg offers you budget estimates, material development, samples and mock ups, art direction and design assistance. They will also custom sculpt and install your custom fireplace; their rigorous standards and technical knowledge will help you preserve your custom fireplace or add to its existing beauty. GFRC is available in a wide variety of colors, finishes and textures. Glass fiber reinforced concrete will stand up to high temperatures. GFRC is very strong and durable. GFRC is an earth friendly product, made from minerals. The skilled professionals at Stromberg Architectural Products will partner with you to make sure your GFRC custom fireplace is exactly as you want. Their proven techniques with renovation and restoration will bring your fireplace back to life. Stromberg is here to help with CAD details, design assistance and all specifications. Contact them today at (903) 454-0904 for your free custom quote and put their 30 years of experience to work for you.